Baltimore has made a living from fishing and boatbuilding for as long as anyone can remember. Things were very bad after the Famine, but picked up a little when Reverend Charles Davis went to plead with Queen Victoria on behalf of his starving parishioners for help to build up a fishing fleet. He was given a letter of introduction to Angela Burdett-Coutts, a member of the Coutts banking family, who eventually became known as Lady Bountiful for her philanthropic acts. To great local joy she donated £10,000 for a fishing fleet and in 1886 opened the Baltimore Fishery School, the first work-study centre in boatbuilding and navigation in West Cork. By the end of the 19th century fishing was in its heyday, with an annual turnover of £ 100,000. To begin with, the catch was mostly pilchards which were pressed for oil and exported through Wales. They were later replaced by mackerel and herring, which were salted and cured. Between 1880 and 1926 Baltimore was the largest fishing port in the country and 78 fishing vessels were registered locally. By 1907, after the North Pier had been built, the fleet was so numerous that you could, it was said, walk to Sherkin across the decks of the boats! At one stage there were seven trains every day out of Baltimore, all carrying fish for the American market. But the good times didn't last and in the early 1950s the Fishery School closed. 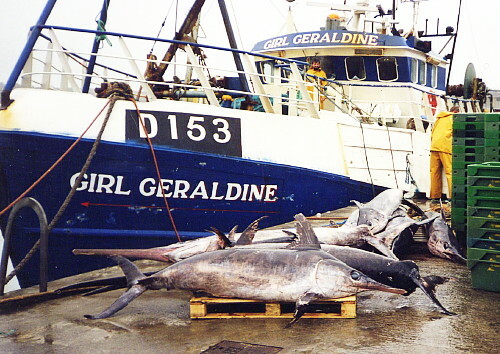 BIM (the Irish Fisheries Board) took over the main Baltimore boatyard, which stemmed the decline. Baltimore families like the Bushes and Skinners had a long tradition of boatbuilding. Among the boats built here was the Saoirse, in which Conor O'Brien and a Sherkin man sailed around the world after in 1923. In 1925 the Ilen, a vessel for the Falklands Trading Company, was launched and delivered by O'Brien with a crew from Cape Clear. Most of the old boatyards have now closed. Two remain at Oldcourt, a few miles up the Ilen River, one of which operates from within the walls of an old O'Driscoll castle. Recently there has been a revival of interest in West Cork's traditional craft, which has given birth to the successful annual Wooden Boat Festival.